Outstanding craftsmanship is on full display in this pink sapphire diamond floral motif ring by Van Cleef & Arpels. 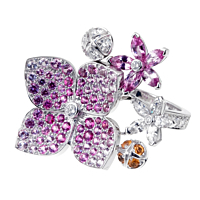 The focal point of the cocktail ring is stunning large four leaf flower, crafted 18kt white gold, and adorned with soft pink sapphires and round brilliant cut diamonds. 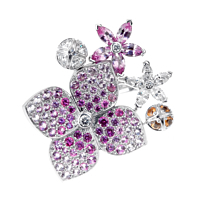 Adding to the magnificence are two additional tiny flowers and petals - also adorned with in diamonds and sapphires. Five additional round diamonds are bezel set along each side of the band.